Launched in 2009, the Illinois Cyber Security Scholars Program (ICSSP) aims to increase the national workforce in the field of cybersecurity and to place graduates in federal agencies, national labs, state, local, and tribal government organizations. The College of Law currently has three students participating in the program, and all of them were drawn to ICSSP for different reasons. Bradley Williams '18 was an undergraduate in the College of Liberal Arts & Sciences when he remembers learning about the program and feeling like it was a perfect fit for his interests. Katie Kramer '18 studied neuroscience as an undergraduate, and was very interested in the legal and privacy implications of emerging brain-imaging technology. She knew that she wanted to pursue a non-traditional legal career where she could contribute to the discussion surrounding these issues. And when McKensie Meadows '19 learned about the program, she saw it as a unique opportunity to set herself apart, gain specialized knowledge, and help increase gender diversity in a field that is currently lacking female representation. Both Bradley and Katie have completed summer internships as part of the program, and McKensie will begin her first internship the summer of 2018. Bradley worked for the United States Attorney's Office for the District of Colorado last summer, where he learned about criminal litigation. "Through ICSSP, I have had the opportunity to travel to areas and speak with professionals that I could not otherwise afford to do independently," he said. Katie worked in Washington, D.C. for the RAND Corporation, a non-profit research institution whose major clients include the Department of Homeland Security, the Air Force, and other branches of the US Military. "My job was to write a report on current legal issues in cybersecurity as part of a larger policy primer for the incoming administration, and to help organize a cybersecurity war game. I loved every second of this internship - I was able to apply everything that I’ve learned in this program, and RAND is a wonderful place to work," Katie said. All three also recently participated in the New York University Cyber Security Awareness Week (NYU CSAW) Policy Competition. The Illinois Law team made it to the final round, along with only three other schools, and will travel back to NYU in early November to present their best legal arguments. 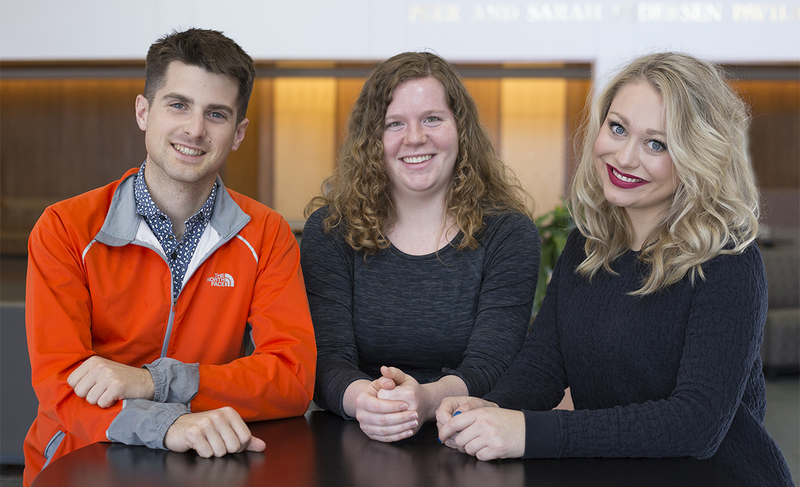 Bradley, Katie, and McKensie have had overwhelmingly positive experiences in the program, and all three said they would recommend it to students interested in government service and passionate about data security and privacy. "This is my first year in the program and I already feel it has prepared me well for a future career in cybersecurity. Being a part of the ICSSP opens doors that would otherwise not be open for networking and researching, and it allows students to set themselves apart from their peers by gaining specialized knowledge in the field of cybersecurity," said McKensie. Katie added, "The opportunity to take Computer Science classes and engage in relevant research projects has helped me better understand legal issues surrounding new technology and contribute to the ongoing discussion of how these issues should be addressed. This is exactly what I want to do with my future career, and I am incredibly thankful for the opportunities this program has given me." The Illinois Cyber Security Scholars Program is supported by a significant grant from the National Science Foundation (NSF) and capitalizes on the particular strengths of the University of Illinois in computer science, engineering, and intellectual property law. ICSSP is open to engineering undergraduate and graduate students and second-year law students with a background in computer science or engineering. Students receive a certificate in cyber security upon completion of the program and undertake a two-year term of employment with the federal government after graduation. Learn more.